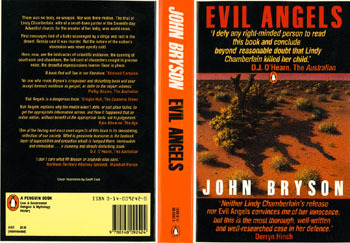 John Bryson, EVIL ANGELS (Penguin Books, 1986), 550 pages. There was no body, no weapon. Nor was there motive. The trial of Lindy Chamberlain, wife of a small-town pastor of the Seventh-day Adventist church, for the murder of her baby, was world news. First messages told of a baby scavenged by a dingo and lost in the desert. Gossip said it was murder. But the nature of the nation’s obsession was never openly said. Here, now, are the intricacies of scientific evidence, the cunning of courtroom and chambers, the full cast of characters caught in precise voice, the dreadful repercussions forever fixed in place. If Job has a female counterpart, this Seventh-day Adventist pastor’s wife may be it. For six years Alice Lynn (Lindy) Chamberlain has been the focus of an entire nation’s attention. Convicted, after two inquests and a trial, of murdering her ten-week-old daughter, Azaria, in the badlands of central Australia, Lindy was released from Berrimah Women’s Prison on February 7, 1986, after serving nearly three years of a life sentence when emerging evidence suggested that she may have been wrongly convicted. The protracted nightmare that began that freezing Sunday evening at Ayers Rock was scripted for the movie A Cry In the Dark (starring Meryl Streep), based on Australian attorney/novelist John Bryson’s hauntingly written 550-page book. The winner of an academy award for best actress, Streep has been quoted as saying A Cry In the Dark was her most meaningful role. Only a few new copies of this vividly written dissection of the Chamberlain case remain from the 1986 Penguin Books printing. The two most famous personalities in mid 1980s Australia were Lindy Chamberlain, wife of Seventh-day Adventist pastor Michael Chamberlain and Michael J. “Crocodile” Dundee. But the Chamberlains are real, and, unfortunately, so was the incident that brought them to the attention of the Australian populous. Pastor Chamberlain, Lindy, baby Azaria, and her two brothers were on a camping vacation in central Australia, at the foot of Ayers Rock, on the evening of August 17, 1980, when Lindy saw a dingo (wild, wolf-like dog) leaving their tent with Azaria in its jaws. Lindy’s next baby (another girl) was born after her conviction and was taken from her immediately. Nearly three years later (February 7, 1986) she was released from prison because critical elements of the Crown’s (prosecution’s) case—lacking a body, a weapon, or a motive—were being discredited publicly. The only infant disappearance that rivals this one for sustained public interest was the Lindbergh baby’s kidnapping in 1932. As the result of publicity and political pressure, a royal commission to investigate the Chamberlain affair was opened in June of 1986, and by November it showed no signs of completion. If any good is to result form the Chamberlain’s sorrow, it should include some correction of the typical Australian’s misunderstanding of Seventh-day Adventists—they don’t believe in blood transfusions, going to doctors, or wearing underclothes. With John Bryson’s Evil Angels, that correcting began.